The Anson history indicates they were involved in the secret societies relating to the Masons. 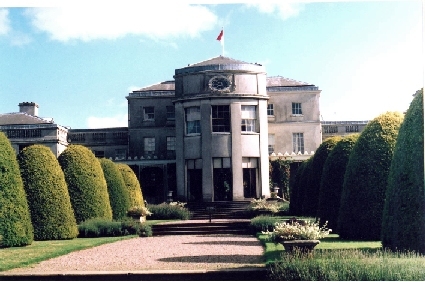 The first Anson family purchased Shugborough in 1624. In 1693 William Anson demolished the existing building and began laying the foundations for a new house. He died in 1720 and Thomas Anson inherited the property. In 1730 Thomas Anson became Fellow of the Royal Society. His proposers were William Jones (mathematician) and the Rev Zachary Pearce (vicar of St Martin-in-the-Fields). In 1732 Thomas Anson and Lord Sandwich founded the Dilettanti Society to promote the study of Ancient Greek Art and Buildings. The Dilettanti Society was an exclusive Dining-Club that had been formed to advance the cultured tastes of Gentlemen who had been on the Grand Tour to Italy. 62 The fact Thomas Anson was associated with the Royal Society reaffirms that the Ansons were heavily invovled with the Masonic Society. It is interesting that Thomas Anson founded the Dilettanti Society. I believe the Ansons may have also been involved or were privy to information about the excavations that went on in Herculaneum and may have found something of historic and scientific significance there that reaffirmed their beliefs. The marble from the Shugborough monument may have even come from Herculaneum. Herculaneum was an ancient city of Italy, situated about two-thirds of a mile from the Portici station of the railway from Naples to Pompeii. It was preserved, along with Pompeii, in the eruption of Mount Vesuvius beginning on August 24, A.D. 79 that destroyed the towns, burying them in ash that had hardened into volcanic tufa.63 In contrast to Pompeii, Herculaneum was a smaller town with a wealthier population at the time of its destruction.64 The temple of Jerusalem had been sacked by Titus in 70 AD. Is it possible that some of the religious artifacts had ended up in Herculaneum and had been buried there by the ash? Thomas' brother George Anson had become a post captain in the navy in 1724 and in 1744 George Anson returned from his circumnavigation of the Globe in the Centurion. Could he have stopped somewhere near Herculaneum on his return? During the War of the Austrian Succession, which went on between 1740-48, he had commanded HMS Centurian on a mission to harass and capture Spanish ships en-route from Acapulco to the Philippines. Anson returned to England after having captured the Señora de Cavadonga, a galleon containing an immense amount of treasure worth around £500,000. His new wealth bought him status and privileges and he rose to become Admiral of the Fleet.71 In 1745 Transformations began at Shugborough.72 Could the marble for the Shepherd's Monument have come from Herculaneum? It was believed that by 1745 all the treasures had been found at Herculaneum. The discovery had excited scholars of all nations; and many of them hurried to Naples to see the marvellous statues and wall paintings. But everything was kept private, as the government wished to reserve to itself the right of illustrating the monuments. Between 1748-9 royal permission was granted to excavate at Herculaneum again at Civitas. The temple of Fortuna Augusta was found at that time but little else.73The goddess Fortuna Augusta is a significant pagan goddess. The prow, rudder and globe are all symbols relating to the Roman goddess Fortuna. In pagan cultures she was identified with the goddess Rosmerta who was often seen paired with Hermes/Mercury. 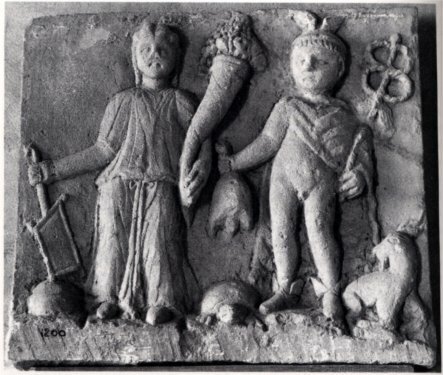 A stone plaque of Mercury and Rosmerta from first or second century AD from Glanum, near Saint Rémy de Provence, France, Figure 2, shows Rosmerta holding a cornucopia, symbol of abundance and Fortuna's emblems of rudder and globe. Hermes is carrying the caduceus, a symbol I associate with DNA.74 Hermes also holds a turtle in this image, which is a sun symbol in the Dogon religion. A goat is beside him, which was a symbol of the Jackal in the Dogon religion. My research indicates Fortuna was the Roman equivalent of Isis. The fact she was associated with a rudder and prow identified her with the sea. As was mentioned in my article on the Shugborough Coat of Arms when referring to the angels in the church at Rennes-le-Château, the alleged Grand Masters of the Prieuré de Sion were known as "Nautonniers" an old French term meaning 'navigator' or 'helmsman'.75 This would have associated her with this group. Between 1748-9, the Spanish military engineer, Joaquin de Alcubierre, had been joined at the Herculaneum excavation by Swiss architect and the father of modern archaeology, Karl Weber, who was much more conscientious in his methods. In 1762- German art historian Johann Joachim Winkelmann wrote an open letter to scholars all over Europe attacking the mismanaged excavation and disgraceful cataloguing and preservation that held sway at Herculaneum and Civitas, despite Weber's efforts.76 This letter was so important to the Anson estate that it was kept by the Anson family when everything except family photos had been sold in 1842 to cover gambling debts.77 Why would this letter have been so important to the estate? The fact it was kept suggests that it had a significant connection. Thomas Anson served as a Member of Parliament for Lichfield beginning in 1747. When his brother George died in 1762, Thomas inherited all his brother's enormous fortune.79 The depth of the Anson interest in pagan and Masonic mythology was evident by the poem that was read in parliament when George died. The poem related to the Shepherd's Monument and had a reference to "reason's finger pointing at the tomb".80 At that time in history, "reason" was identified with science and hermeticism. The late 1700s was the period of the age of reason. In the poem there was a reference to the lover's breast and the marble associated with the monument. This relates to the Dogon religion where a love affair between two of the eight ancestors ruined the Nummo's genetic engineering experiment thereby causing humans to lose their immortality. The quote is reiterating the fact that no matter how passionate lust and love can be, it can never negate the fact that mortality and death are a part of the human condition. In an anonymous poem dated 1767 relating to Shugborough, a reference was made to "righteous men" being wrapped in "Elysium".82 Elysium was associated with Eleusis in Greece, and the Eleusian mysteries associated with the Greek goddess Demeter. Demeter's relationship to Dogon mythology was talked about in The Master of Speech. This is likely the source of the Irish and Welsh Celtic myths relating to "Bran the Blessed", the "Cauldron of Regeneration" and the islands of the Otherworld. The goddesses associated with these myths were also shape shifters90 in the same way the Nummo were described as being shape shifters by the Dogon. The Elysian Fields may also be connected with Simon Baruch, and the Hebrew word "Barûkh," which meant "blessed" and talked about in my earlier article on Shugborugh as being a possible synonym for Nicholas Flamel. In Greek mythology, the Elysian Fields also meant the "plains of arrival" perhaps indicating the location of the eight ancestors first descent to Earth. It was also associated with the doctrine of the transmigration of souls, and how lives were several times repeated on both sides of the Earth.91 This is important because the Nummo were supposed to have been immortal and associated with reincarnation. The name "Eleusis" was what Margaret, Countess of Lichfield was likely referring to when she mentioned "Alicia", which she said meant "joy and happiness". The Countess believed the letters on the Shugborough Shepherd's Monument meant, "Out of your own sweet vale Alicia vanish vanity twixt Deity and Man, thou Shepherdess the way". The settlement of Eleusis was founded in Athens in ca. 2000 B.C. on the slopes of one of the hills.92 Like Rome, Athens was also built on seven hills. It is located on the Attica plain on the Greek mainland.93 The name "Athens" was also named after the goddess "Athena", who is related to this mythology and whose name starts with "A". A sculpture of a celtic pagan goddess found in the Romano-Gaulish town of Alèsia in Burgundy may also be related to "Alicia" and "Eleusis". The goddess, found in the town of Alèsia, located on Mont Auxois near Dijon, carried a cornucopia, which was the symbol of abundance. She was also associated with spinning, which was a characteristic of Athena. In the Dogon religion, the Master (Mistress) of Speech was identified with weaving. The goddess from Alèsia was also seen with a steering oar, the prow of a boat and a globe connecting her to the pagan goddess Fortuna.94 The temple of Fortuna Augusta was found at Herculaneum and discussed earlier. I associated Fortuna to the alleged Grand Masters of the Prieuré de Sion who were known as "Nautonniers" an old French term meaning "navigator" or "helmsman". Other Gallo-Roman temples found in the town of Alèsia, included shrines to the goddess of horses, Epona and to the Mother Goddess. The horse goddess Epona relates to the Nummo and "horse of God" talked about in one of the ciphers at Rennes Le Chateau. The town of Alèsia also held a Merovingian basilica, then a medieval convent and shrine, which became famous for its mystery plays.95 The mystery plays were identified with the Eleusian mysteries and Demeter. The Shugborough poem also referenced the River Ilissus, which was mentioned in Plato's Phaedras as the place where the wind god Boreas was said to have carried off Orithyia. As was mentioned earlier, forbidden love is an important theme of the pagan religion. Boreas, who once appeared on the Tower of Winds found on the Shugborough grounds, was portrayed in ancient drawings with serpent-feet. He was a major winged figure in Greek mythology with two faces, one looking forward and one looking backwards.99 Refer to The Nummo for more information on Boreas. Besides suggesting his dual nature, the faces suggest a sense of the Alpha and the Omega, the beginning and end. In the Shugborough poem, the River Ilissus was compared to the Trent River, and the Vale of Tempe to the grounds of Shugborough. The Lysikrates Monument, also known as the "Lantern of Demosthenes", which appears on the Shugborough grounds also appears in Athens. Demosthenes, who lived from 384 BC - 322 BC, was generally considered the greatest of the Attic orators. Demosthenes prosecuted his fellow envoys for failing to create a peace treaty with Philip II of Macedon. During the trial, Demosthenes was accused of sexual and gender impropriety. The prosecutor "Aiskhines attributed Demosthenes' nickname, Batalos ("arse"), to his 'unmanliness and kinaidia' and frequently commented on his 'unmanly and womanish temper', even criticising his clothing: 'If anyone took those dainty little coats and soft shirts off you ... and took them round for the jurors to handle, I think they'd be quite unable to say, if they hadn't been told in advance, whether they had hold of a man's clothing or a woman's. '"103 These references are important because they identify the androgynous nature of Demosthenes. The fact he was an orator could also be a symbolic reference to, "the Master Of Speech", in the Dogon religion. His father had also been a famous sword maker suggesting an association to metals and the Smithy. In the Dogon religion the alien Nummo's spaceship was identified with a Smithy. It was in the Smithy where humans were created and regenerated. More about the Smithy can be found in Chapter 2 of The Nummo. Dual fish tailed figures also appear on the monument. In Dogon mythology, a symbol replicating the horned helmet represented the severed head of the Master (Mistress)of Speech. It signified a fish with its barbs or whiskers. The Nummo were identified with the catfish, which is why the gorgon and serpent figures seen on many artefacts have whiskers. The "Green Man" with whiskers found in the Rosslyn Chapel is also related to the green Nummo. In later history, the Nummo became associated with cats. This association explains why cats are usually seen with witches in later myths.104 According to Kemp, "Shugborough means the place of the witch". There is also the "Cat's Monument" that appears on the grounds at Shugborough. The interesting thing about the monument is that dual rams are also shown on it. The ram was another symbol of the Nummo in the Dogon religion. Both the Nummo and the Master (Mistress) of Speech were identified as hermaphroditic figures but associated with the sacred feminine. In later mythologies they were identified as being "twins". It is possible that St. Martha and Mary of Bethany became the later Christian versions of the earlier pagan myth of the "twins". In the early Christain church Jesus was also thought to have been a twin. St. Martha and Mary's brother Lazarus, who is resurrected by Christ, may in fact represent the androgynous Lébé who was regenerated by the Master (Mistress) of Speech, the pagan Christ figure. Because the Nummo were self-fertilizing, they were also identified with virgin goddesses. Joan of Arc, (Jeanne d'Arc), known as the "humble shepherdess" and the "virgin from Lorraine", was also connected to this mythology.122 At that time in history, her leadership traits would have identified her with the masculine androgynous characteristics of the Nummo. St. George is likewise related to this mythology. The story of St. George slewing the dragon identifies St. George with the Jackal and Smith figures of the Dogon religion. The Rose-Croix was the cross of St. George connecting the myth with the Rosicrucians. The Rose-Croix was likewise related to the Romance of the Rose by Jean de Meung and was in Dante's paradiso. Frances Yates also identified Leonardo Da Vinci as a Rosicrucian.123 Leonardo Da Vinci wrote from left to right as well as from right to left, which my research indicates was a characteristic of the writing style of the alien Nummo who I speculated communicated using sonar.124 Reading the letters in reverse was also the key for the decipherment of the Shugborough Shepherd's Monument, which was represented by Poussin's painting and talked about in my first article. These references relate to the pagan mythology. For more information on these associations refer to The Master of Speech and The Nummo. If you would like to contact the author, email sd@themasterofspeech.com. Follow this link to Shugborough Coat of Arms. 71http://lord-lichfield.biography.ms Biography.ms. Earl of Lichfield. 75Michael Baigent, Richard Leigh and Henry Lincoln p.133. 80Michael Baigent, Richard Leigh and Henry Lincoln p.191. 81Michael Baigent, Richard Leigh and Henry Lincoln p. 191. 81aMichael Baigent, Richard Leigh and Henry Lincoln p.40. 81bMichael Baigent, Richard Leigh and Henry Lincoln p.250. 81cCarl Kerényi, The Gods of the Greeks. (Harmondsworth, Middlesex, Penguin Books Ltd. 1958.) p. 130. 81dMichael Baigent, Richard Leigh and Henry Lincoln p.249. and The Master of Speech, The Navel Stones, p.100. Yggdrasil The World Ash Tree. H. J. Carol Thompson.. AKA. Stormsdottir. Copyright 1989-2004. Virgil and the Golden Bough. 91The God of the Greeks, Carl Kerényi p.219. 94Celtic Goddesses Miranda Green, British Museum Press, p.108. 98The God of the Greeks, Carl Kerényi p.210. 105Michael Baigent, Richard Leigh and Henry Lincoln p.26. 108Shannon Dorey, The Master of Speech p.154. 121Shannon Dorey, The Master of Speech p. 161. 122Michael Baigent, Richard Leigh and Henry Lincoln p.140.